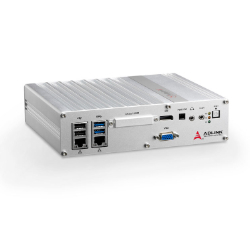 ADLINK Technology has launched the MXE-1500 Series of fanless embedded computers. The successor to the company’s MXE-1300 Series, the MXE 1500 offers richer I/O interfaces, and more flexible I/O configurations in the same compact enclosure. Intel Celeron(Braswell) processors, Intel’s last generation of CPU to support Windows 7, power the device to a 90% increase in image processing capabilities over the past generation, and support three independent displays, collectively producing an unequaled price/performance ratio and making the device an ideal choice for industrial automation applications and mass transit operators.